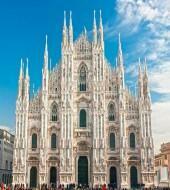 Milan Cathedral is the symbol of Milan, one of the symbols of Italy and is the third Catholic church in the world. It is dedicated to Santa Maria Nascente and is the seat of the Archibishop of Milan. The Gothic cathedral took almost six centuries to finish and is the fifth largest cathedral in the world, and the largest in all of Italy. Because of the long waiting lines Ticketbar recommends to buy your tickets in advance! Daily 9.00 – 18.30. Last ticket 18.00. Closed on Christmas Day and 1st May. Piazza del Duomo, 20122 Milan, Italy.